I have a very simple motto, I make the wines for myself. I can only sell the wines that I like. Thankfully, there seem to be many people who share my taste! The countdown to ProWein in Düsseldorf is running. 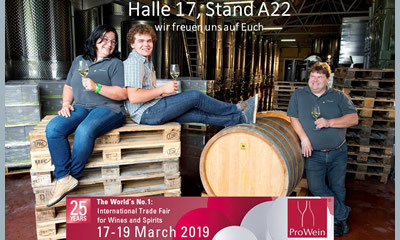 https://www.forstreiter.at/wp-content/uploads/2019/02/prowein-duesseldorf.jpg 240 400 redaktion /wp-content/themes/enfold-child/images/logoMitWappen.svg redaktion2019-02-23 11:44:022019-02-23 11:52:10The countdown to ProWein in Düsseldorf is running.